Be the first to share your favorite memory, photo or story of Tabitha. This memorial page is dedicated for family, friends and future generations to celebrate the life of their loved one. 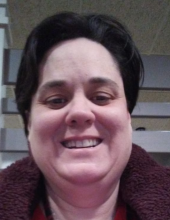 Tabitha Jean Auten, 45, of Mason City, died at MercyOne Medical Center North Iowa on Thursday, March 21, 2019. A memorial service will be held at the Salvation Army Church, 474 Village Green Drive, on Tuesday, March 26, at 1:00 p.m. with Pastor Wendall Mohler officiating. Tabitha Jean (Mohler) Auten Daughter of Wendell W. and Mary Susan (Purcell) Mohler was born in Garden City, KS Jan. 21, 1974 and passed from this earthly life from her Home in Mason City, IA., Thurs, March 21st, 2019 as a result of a Pulmonary Embolism, at the age of 45. For some time now, she has longed and, eagerly looked for, expectantly watched every day for the return of her Savior Jesus to return in the clouds in what is known as the Rapture, when Jesus would take her, Blake her Husband, her 2 Daughters, and her Family along with all who have placed their faith in Jesus by entering into a personal relationship with God just as she had many years ago completely by faith as a gift of grace, by receiving Jesus Christ into their hearts for the forgiveness of their sins and accepting His eternal gift of life ever more, Eternal Life which Jesus purchased and paid for with His Own blood, and in our place on the cross, and then overcame death in raising up from the dead. She never lived to see The Rapture but she is indeed with her Jesus now. Tabitha departed from this life on Thursday morning lying on their bathroom floor where she collapsed during her regular morning activities. Her loving and faithful Husband hearing her fall to the floor called for help and attending to her needs as best he was able, until the Paramedics arrived and took over her care, trying to revive her. Due to the severity of the embolism, her resuscitation was not successful, she was then transported to Mercy Hospital where she was pronounced deceased at approximately 10:30 am. Blake never gave up the fight to bring her back to life even after he was given the news he held clung to hope beyond hope as he clutched her hand where she lay on the bed there in the hospital, praying and pleading for the life of his Bride of two short years and 4 days. No one ever wants to let their beloved leave this world like Tabitha departed, however the decision as to when and where as well as how long this life lasts is totally in the will of God as is only proper. Blake, as well as all of us who loved her, feel the grief and loss of her death and absence from our lives. She indeed will be missed. We however, also rejoice in knowing that Tabitha upon leaving us, entered into the very thing she inwardly longed for more than anything else, her heavenly Home, and into the arms of her Savior Jesus. Delivered out of the presents of sin, pain, corruption and death, forever. Rather than to wish her back, we rather long to be there as well, but also know the importance that others on the earth also receive the opportunity to know that they can also have eternal Life when their day to leave this earth comes. Tabitha gave her life and heart to Jesus asking Him to become The Lord and Savior of, and over , her life from that time forward; when she was 9 years old. She understood that she like all of us was a sinner and as such guilt of facing eternal separation from the presents of God. She also understood that God had provided a way in which her sins could be taken away because Jesus has paid her penalty for her, if she only ask Him to save her, take her place, pay for her sins, that He would not only do that for her, He would also dwell with in her heart for all the time she lived on this earth, and He would either come back in the clouds to call her up to him, or be there in Heaven to receive her if she died before the time He would return in the clouds, and she could also have eternal life with God; Father, Son, and The Holy Spirit. Even as a young girl she understood that this was the best deal she or anyone would ever have available to them, and she prayed with her Dad in her bedroom at Morrison, CO. asking Jesus to come in to her heart . Tabitha lived in this knowledge her entire life, her first obedience was in receiving baptism albeit in the freezing cold spring water of the Rocky Mountains at Kittridge, CO. a short time after she received Christ, and along with her Mother & her Dad at the same time. It is in this knowledge and confident assurance that those of us who loved her most are at rest her today. Our loss is minimized by the perfect assurance of where Tabitha is now, and Who she is with now and forever; and in that knowledge we live and are confident that we will also experience this same reward just as Tabitha did until the moment before she departed this world and began a new life. Tabitha spent most of her life serving others. From a young age she began to be involved in caring for less fortunate people, she grew up in the Ministry as a Preacher/ Missionary's Kid in 4 different Congregations, in 3 different states including Jefferson, CO., Munden, KS & Mezeppa & Zumbro Falls, MN.. She had a beautiful face and tender forgiving heart to match. Life was never easy for her, Tabitha lived in a black and white kind of understanding which often lead to her being criticized, bullied, made fun of, and shunned by others, as a child and adult. She struggled to understand the why's and to find ways to be enough like others to not be treated differently, but was never able to shed that difference. This very hardship helped her in her compassion for others, in spiritual situations as well as physical ways. She had a strong desire to see everyone come to a saving knowledge of Jesus Christ, and to help everyone be free from hurts, mental and physical. She was tormented when anyone was disparaged or belittled, bullied, of treated badly. Many hours were spent in tears with Mom or Dad sharing and dealing with her broken heart . Tabitha shared much happiness, and also suffered much sorrow and hurt in her 45 years of life. beginning in high school she worked in rest homes, taking a leave in order to go on a summer mission trip to Panama where she helped to build structures for villagers in the deep jungle there and to use her high school Spanish to share Jesus and teach and visit and love. Beside the joy of ministering to the nationals there, she also had the opportunity to go monkey hunting in the jungles and really enjoyed that experience. She worked at a number of different rest homes in MN. including homes for the Elderly and with REM where most of the clients were handicapped and/or mentally challenged, and then later worked in several meat packing plants for both Quality Pork Processors and Hormel Foods in Austin, MN. During her working career she had two Daughters the first Julia was born Aug 1996 and she raised her as a single mother until her marriage in 2000, to Allen Roberts, who came to the USA from Grimsby, England UK. In order to take Tabitha as his bride. unto to that union was born a second daughter Lucy, in December 2003. It was while employed at Hormel Foods in 2003, Tabitha experienced a pulmonary embolism at work while climbing the stairway up to her locker and was taken to Mayo Clinic Rochester, MN in critical condition. She recovered for the most part from the embolism leaving her scaring and a clotting risk as a life-long possibility, thus ending her ability to work outside the home thereafter. Tabitha traveled and lived in England with her Husband and Family living in Grimsby, UK. for 2 years before returning home to Austin, MN. The Family moved to Mason City, IA in 2006 where several relationship changes transpired and changed her Family completely. While living alone again for a number of years there after. In 2004 she met Blake, and after several years of building a relationship, they were married March 17, 2017 and began their lives together caring for one another in a very special relationship, and just celebrated their second year Anniversary last Sunday March 17th. In December Tabitha experienced a period of mental challenges due to medication changes we believe, and had finally recovered from that horrific experience only two weeks before her death. However; God truly arranged a number of very special and wonderful things to occur over these last two weeks, which will be treasured and held from that day forward in Blake's memory, Had God not given Tabitha and Blake these last two weeks of joy and events together, her passing would have terrifically magnified Blakes sorrow and ability to grieve the loss of his beloved wife. We thank God in His mercy and abundant grace for giving Tabitha and Blake these last several special weeks together before calling Tabitha to leave their relationship and to come Home to Him. While moving around with her Missionary Parents as they served different Churches, Tabitha attended a number of grade schools including a private Christian School in Belleville, KS. , attended high school at Zumbrota, MN and graduated from John Marshall High school Rochester, MN. 1996 She also attended some class' at Rochester Community Technical and Junior Collage in Rochester, MN.. as well as earning a certification as a Certified Nursing Assistant CNA. at Red Wing, MN. Tabitha is preceded in death by both her Maternal and Paternal Grandparents, John Joseph (Jack) & Ruth Purcell and Vernon E. & Mary Jane Mohler; 2 Uncles and one Aunt, John Michael & Wife Debbie Jo. Purcell, and Ed Hanlon. She is survived by Her Husband Blake Auten, former Husband Allen Roberts, Mason City, IA ; Daughters Julia Mohler, Chattanooga, TN. and Lucy Roberts, Mason City, IA. Parents Wendell W. and Mary Susan (Purcell) Mohler, Pikeville, TN. ; Brother William Joseph and wife Jenny Mohler of Elgin, IA. Brother-in-Laws Ron (Cathy) Auten, Jason (Misty) Auten , and Jordan, of Fort Dodge, IA Sister-in-laws Betsy (Doug) Gregerson, Humbolt, IA. , and Renee Auten, Fort Dodge, IA. ; as well as Aunts, Uncles, Nieces, Nephews, Cousins, and many Friends. To send flowers or a remembrance gift to the family of Tabitha Jean Auten, please visit our Tribute Store. "Email Address" would like to share the life celebration of Tabitha Jean Auten. Click on the "link" to go to share a favorite memory or leave a condolence message for the family.